The twin STEREO space observatories designed to change the way we view the sun launch from Cape Canaveral aboard a Boeing Delta 2 rocket. With launch of the Upper Atmosphere Research Satellite from space shuttle Discovery in September 1991, a new era in studying Earth's environment from space began. The crew of STS-48 describes the mission in this post-flight film, which includes an beautiful nighttime flyover of the United States. Astronauts, rodents and jellyfish were the subjects during extensive medical tests performed aboard the first Spacelab Life Sciences mission launched in June 1991 aboard shuttle Columbia. A space laboratory module riding in the payload bay housed the experiment facilities. The crew of STS-40 explain the mission in this post-flight film. A progress report on development of the Orion crew exploration spacecraft and the Ares launch vehicle is given during this briefing held October 18 at the Glenn Research Center in Cleveland. Some of the initial pictures and data from NASA's Mars Reconnaissance Orbiter since the craft entered its mapping orbit around the Red Planet are presented in this news briefing held October 16 from the Jet Propulsion Laboratory. Astronomers using the National Science Foundation's Very Large Array (VLA) radio telescope have discovered giant, ring-like structures around a cluster of galaxies. The discovery provides tantalizing new information about how such galaxy clusters are assembled, about magnetic fields in the vast spaces between galaxy clusters, and possibly about the origin of cosmic rays. "These giant, radio-emitting rings probably are the result of shock waves caused by violent collisions of smaller groups of galaxies within the cluster," said Joydeep Bagchi, of the Inter-University Centre for Astronomy and Astrophysics in Pune, India, who led an international research team. The scientists reported their findings in the November 3 edition of the journal Science. The newly-discovered ring segments, some 6 million light-years across, surround a galaxy cluster called Abell 3376, more than 600 million light-years from Earth. They were revealed because fast-moving electrons emitted radio waves as they spiraled around magnetic field lines in intergalactic space. "Even from this large distance, the feeble radio waves were easily picked up by the VLA, thanks to its very high sensitivity and unique capability to make images of exceedingly faint radio-emitting objects," Bagchi said. The scientists also used the European Space Agency's XMM-Newton, the world's most sensitive X-ray observatory, to observe this extraordinary cluster of galaxies. "The advanced technical capabilities of the orbiting XMM-Newton revealed a spectacular bullet-like region of X-ray emission in this dynamically active cluster," said Gastao B. Lima Neto, of the Institute of Astronomy and Geophysics in Sao Paulo, Brazil, a co-author of the research paper. "Our X-ray observations strongly suggest a recent collision and merger of two or more smaller clusters. Such a phenomenon is among the most energetic events in the Universe after the Big Bang. Only a tiny fraction of the total energy of this collision, if transferred to electrons, would cause them to emit the radio waves observed by the VLA. However, the main question is, how this is achieved," said Florence Durret of the Astrophysical Institute of Paris, France, another of the researchers. The scientists calculated that the total energy of the colliding groups of galaxies would be enough to keep our Sun shining for more than 20 sextillion years (2 followed by 22 zeros)! "We think the shock waves that sped up these electrons came from the collision of a smaller group of galaxies with the main body of the larger cluster. When two such massive objects crash into each other at supersonic speed, gigantic ripple-like shock waves are created in the surrounding gas, which race out to the outer regions of the forming cluster at a speed of thousands of kilometers per second," Bagchi said. "You can imagine that each cluster is like a supersonic aircraft, moving faster than the speed of sound in the surrounding gas, and just as you hear a sonic boom when shock waves from an airplane pass by you, we believe that the situation in the Abell 3376 cluster is similar, with ringlike radio structures tracing out the shock waves," Bagchi explained. Such a scenario also is supported by images of the cluster made with the XMM-Newton and ROSAT X-ray satellites, as well as by computer simulations, Bagchi added. The exact mechanism for producing the shock waves is still open to question, the scientists said. 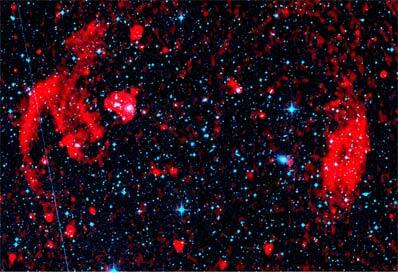 "This is the first observational evidence for this type of shock wave around a massive galaxy cluster," Bagchi said. "This discovery will help us understand more about the thin gas between the galaxies, and also about the magnetic fields in the outskirts of such clusters -- magnetic fields whose origin still is unknown," he said. In addition, the scientists speculate that violent regions like those in Abell 3376 may be sites from which cosmic rays originate. Cosmic rays are protons or atomic nuclei accelerated to nearly the speed of light, and shocks such as those found in the collisions of galaxy groups may be energetic enough to provide the required amount of "kick." "Some of the most energetic cosmic ray particles detected on Earth may contain about 100 million times more energy than the highest energy achieved so far in any man-made particle accelerator. Where do these cosmic rays come from and exactly what process kicks them to such stupendous energy is still a fascinating unsolved problem of physics," said graduate student Surajit Paul of the Institute for Theoretical Physics and Astrophysisc at Wuerzburg University in Germany, who was on the research team. "A cosmic accelerator source containing powerful shock waves and magnetic fields extending over millions of light years in length is capable of accelerating a proton or nucleus to such enormous energies. Although our observations do not conclusively show the evidence for such particles, our VLA radio image does show clearly that such structures are indeed present in this galaxy cluster. Only future cosmic ray observations can tell if Abell 3376 is an ultra-high-energy cosmic ray source. We will continue to explore this fascinating cosmic laboratory in the future, employing some of the world's most sensitive radio, X-ray and gamma-ray telescopes to reveal its mysteries," Bagchi said.